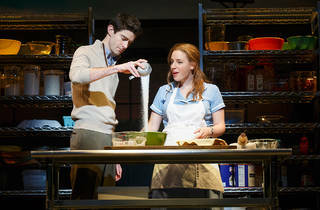 One’s sorely tempted to praise the delightful new musical Waitress using lots of bakery metaphors. 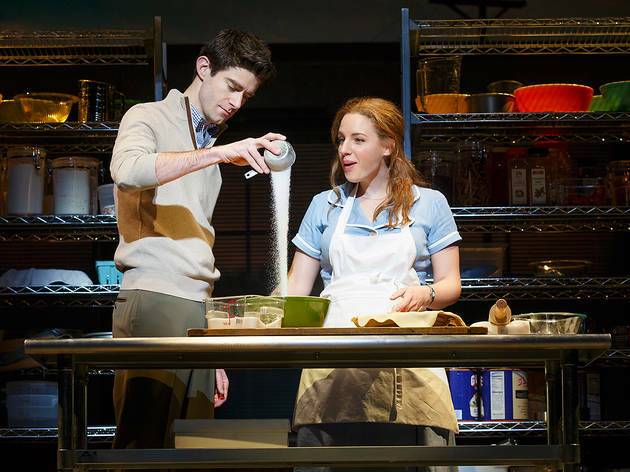 After all, its hero is a pastry genius with relationship woes named Jenna (Jessie Mueller). She’s a perky Southern gal who can confect a mouthwatering Mermaid Marshmallow Pie but can’t measure the right ingredients for happiness. 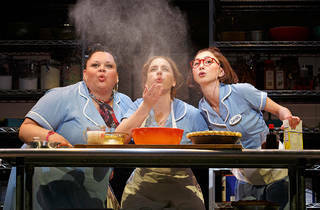 So, unable to resist, here I go: Fresh and delicious, Waitress has an excellent ratio of sweet to tart; supporting characters who provide crustiness (Dakin Matthews’s grumbly store owner) and flakiness (Christopher Fitzgerald’s loony admirer of another waitress); and cooked-to-perfection staging by Diane Paulus. The whole dish is—please forgive me—love at first bite. 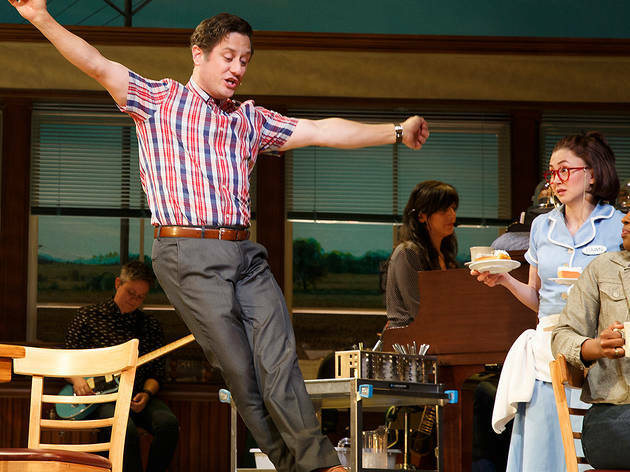 Based on the 2007 indie film by the late writer-director Adrienne Shelly, Waitress has been whipped (I’ll stop now) into an expertly constructed and emotionally satisfying tale of self-liberation in the face of limited options. 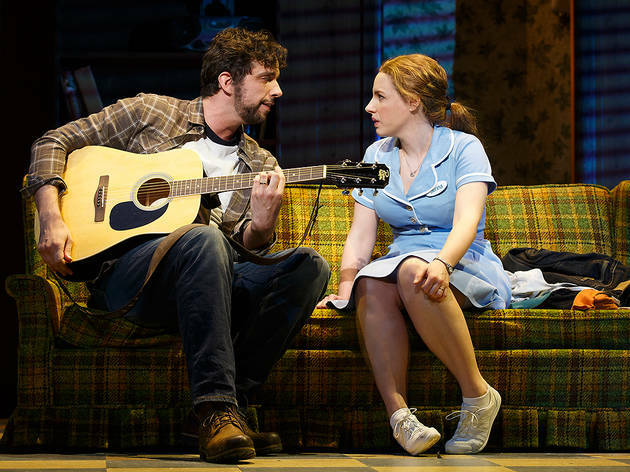 Jessie Nelson’s broadly comic yet brooding book meshes wonderfully with a frisky, bright score by pop star Sara Bareilles, a seasoned songwriter who lets the Beatles and other Britpop influences shine through. 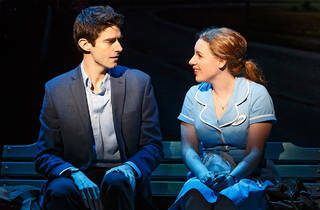 Bareilles’s custom-built earworms address workplace pluck (“Opening Up”), first-date jitters (“When He Sees Me”), quirky, obsessive love (“Never Ever Getting Rid of Me”) and an eleventh-hour ballad of loss and regret (“She Used to Be Mine”), which will rip your heart out. 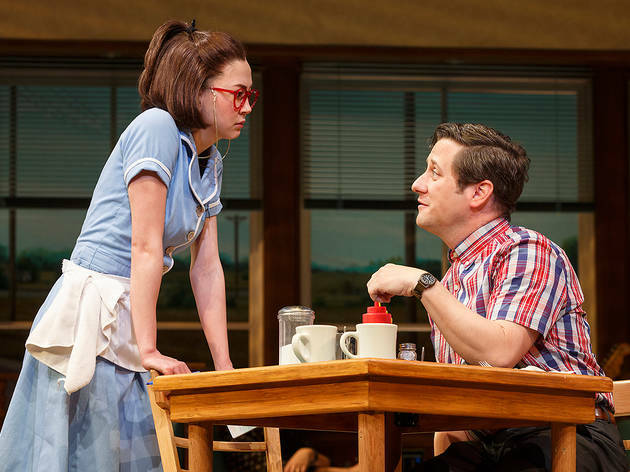 That’s a nasty sounding operation, but you couldn’t find a nicer set of hands to do it than those of Mueller, who adds Jenna to her gallery of beautifully realized characters that blend warmth, shyness, courage and a gorgeous, unforced soprano. It so happens that although Mueller is charming and radiant as always, she has key support in the kitchen and on the floor. As fellow waitstaff—mousy Dawn and bullish Becky—Kimiko Glenn and Keala Settle keep the story bubbling along with their own romantic subplots, even as they give moral support to their unhappily pregnant friend who’s entangled with an abusive husband (Nick Cordero) and plunging headlong into an affair with her very married yet very crushable doctor (Drew Gehling). 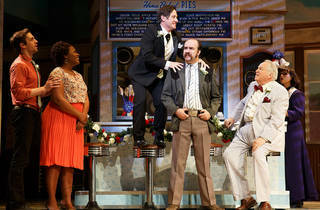 Brooks Atkinson Theatre (Broadway). Book by Jessie Nelson. Music and lyrics by Sara Bareilles. Directed by Diane Paulus. 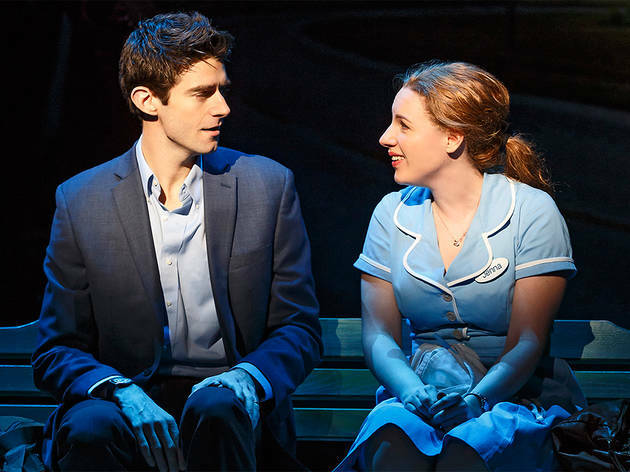 With Jessie Mueller, Kimiko Glenn, Keala Settle, Nick Cordero, Drew Gehling, Christopher Fitzgerald, Dakin Matthews. Running time: 2hrs 35mins. One intermission. 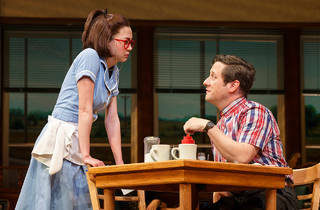 I saw this with the new cast and they were absolutely brilliant. The script was incredibly written, and the way the characters performed was not only with talent, but with credibility. I found their personalities relatable, personable, and fun! The choreography was both creative and silly. 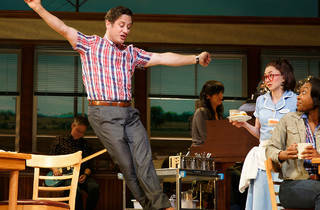 The whole theatre turned into a diner and I had the best time. 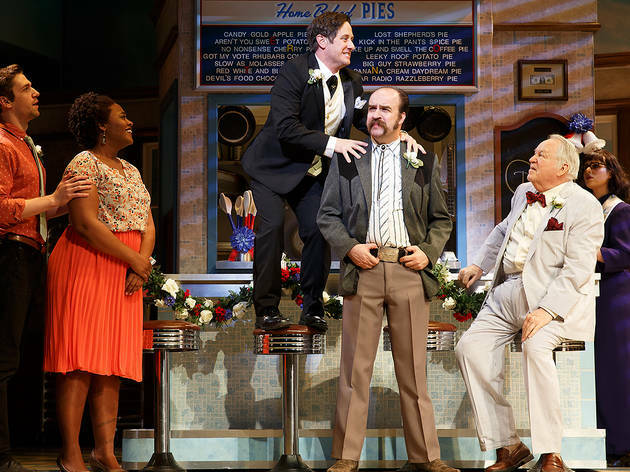 I laughed more than I ever have at a broadway show, and for all the right reasons. This past weekend, the show was 50% off at TKTS and it was the best deal! I would love to see this show again. Just saw this for Sara Barellies' brief appearance as Jenna and it was great! 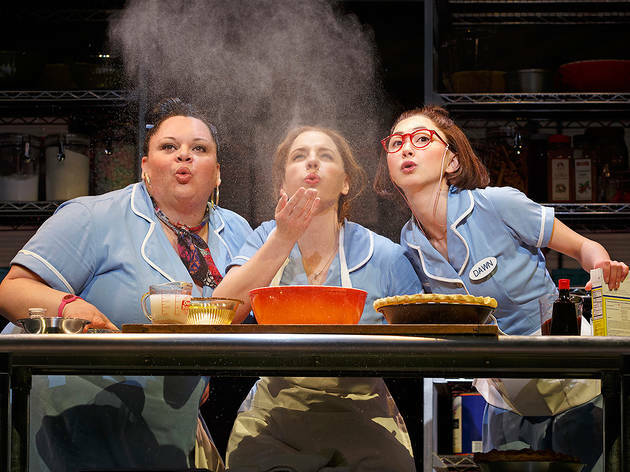 The lobby smells like pie! 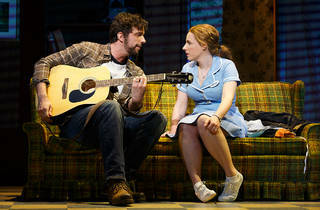 All the performances were great, especially the actress playing Becky! And for being a trained actress Sara was also really good! I just wish they did rush or lottery tickets! The only affordable way to see this show is to stand in line for standing room tickets! Although the view from there is very good!